A ring base is available for attaching to the top of conventional 1 inch wide rings that have a 1/4x20 threaded opening. The base has a transverse slot that is 1 inch wide. The top of a ring platform fits into the transverse slot and a flat head screw attaches the base to the ring. The MRF Finder slides into the two small grooves machined into the sides of the ring base. A Flat Base is available for attaching to a flat surface or a surface with low curvature. 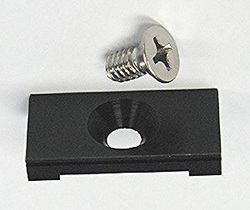 The flat base has two counter sunk holes for attaching the base to a scope or mounting bracket. 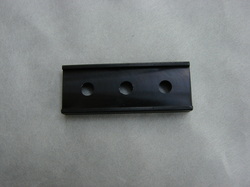 Also, the flat base is supplied with a piece of double-sided tape for adhering the flat base to a scope or binoculars. 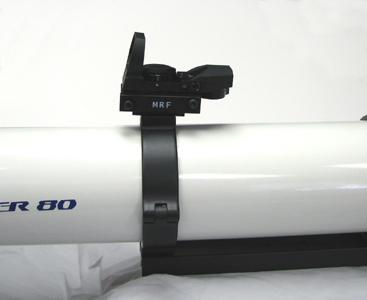 MRF shown on Dovetail Base with Adapter. 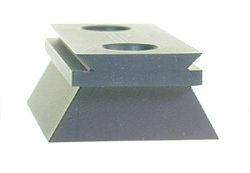 A dovetail base is available for attaching the MRF to a standard Vixen/Orion dovetail base. 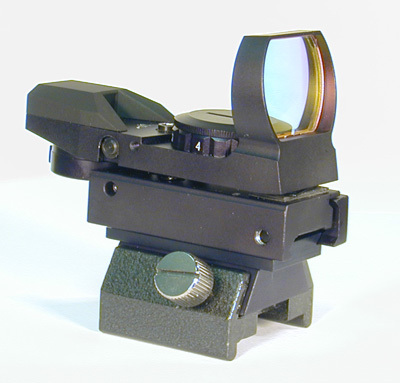 The dovetail base is a low-profile base that is best used for dovetail mounts attached to the optical tube. The center of the MRF window is approximately 2-1/8" above the inside-bottom of the dovetail mount. A Radius Base is available for attaching to curved surfaces from 3" in diameter and larger. 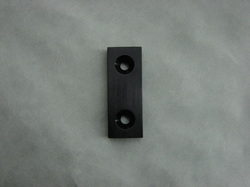 The radius base has three counter sunk holes for attaching the base to a scope or mounting bracket. Also, the radius base is supplied with 2 1/4-20 screws.